The Winnipeg Jets meet the Florida Panthers tonight for the first of two games during the NHL Global Series in Helsinki, Finland…The second game of the two-game series goes Friday…These two games are the back half of a four-game road trip for the Jets, which started with a 2-1 win against the Detroit Red Wings on Friday before a 3-2 loss to the Toronto Maple Leafs on Saturday…After returning from Finland, the Jets begin a four-game homestand against the Colorado Avalanche on Nov. 9. Tomorrow is the fourth of five consecutive games for the Jets against an Eastern Conference team…The Jets are 2-2-0 against Eastern Conference teams this season…Winnipeg went 19-7-6 against the Eastern Conference last season, including a 10-3-3 record versus the Atlantic Division and 9-4-3 record against the Metropolitan Division…Blake Wheeler led the Jets with 37 points (10G, 27A) in 31 games against the Eastern Conference, which was tied for fourth among Western Conference players last season…Goaltender Connor Hellebuyck went 15-3-5 versus the East. The Jets have scored a power play goal in eight consecutive games, going 9-for-25 (36.0%)…The Jets have tied a franchise record for most consecutive games with a power play goal, which has occurred twice before – Jan. 1-18/06 (23.3%, 14-for-60) and Oct. 15-30/10 (28.6%, 12-for-42)…The Jets have had less than half the power play opportunities in this streak than in 2006 and just more than half the opportunities than the 2010 streak…Winnipeg is 31.4% on the power play this season, which is third in the NHL…Mark Scheifele, Kyle Connor and Patrik Laine lead the Jets with three power play goals this season and are the only members of the Jets with multiple power play goals. Mark Scheifele was named the NHL’s Second Star of the Week on Monday for the week ending Oct. 28/18…He matched a career-high with four points (2G, 2A), including an assist on the overtime winner, to lead the Jets to a 5-4 comeback win over the St. Louis Blues on Monday…On Wednesday, he tallied a power play goal in a loss to Toronto…Scheifele assisted on Kyle Connor’s tying goal as Winnipeg again came from behind to beat Detroit on Friday…On Saturday, the Kitchener, Ontario native scored in a losing effort against the Maple Leafs…. In total, Scheifele tied for an NHL-best seven points (4G, 3A) for the week…This is the fourth time in his career that Scheifele has been selected in the NHL’s Three Stars of the Week…He is the first Jets player to be selected in 2018-19 after Winnipeg had eight appearances in the Three Stars of the Week last season. Jets defencemen Dustin Byfuglien and Dmitry Kulikov played in Helsinki during the NHL’s Premiere Series in 2009 when the Chicago Blackhawks played Florida…Byfuglien had a goal and an assist to lead the Blackhawks to a 4-0 win against Kulikov’s Panthers. 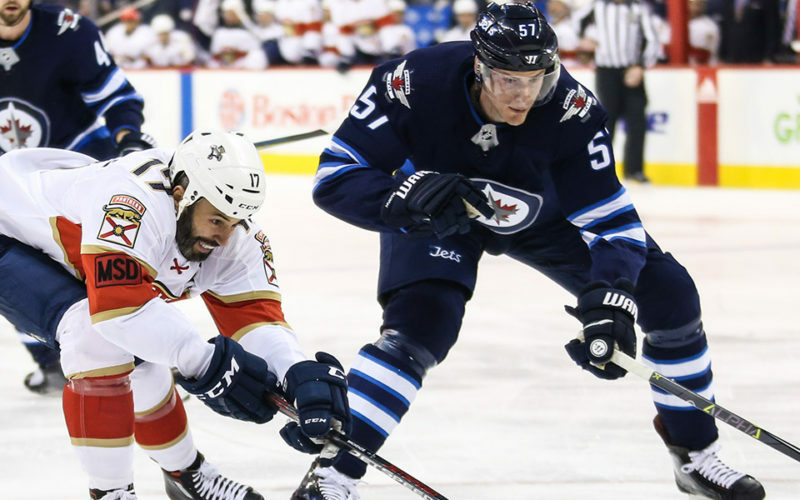 Blake Wheeler had an assist on Saturday to extend his point streak to six games (1G, 6A), which is the longest scoring streak by a member of the Jets this season…Mark Scheifele (4G, 4A) and Kyle Connor (2G, 4A) are on five-game point streaks.